A heavy duty industrial user needed to charge up to 24 Molicel battery packs, model MCR-1821C at one time. This charger has independent charging circuits. We worked with E-One Moli Energy (Canada) Limited to meet their charging and safety requirements. Each battery is fully independent and its own smart controller, and status LEDs. The power supply has universal input 85 VAC to 235 VAC 50/60 cycle. The microprocessor controlled charger boards monitor fault conditions as well as monitor each battery separately for state-of-charge and end-of-charge. Options: This product type could be extended to any number of batteries, different battery chemistries, and different charge algorithms. 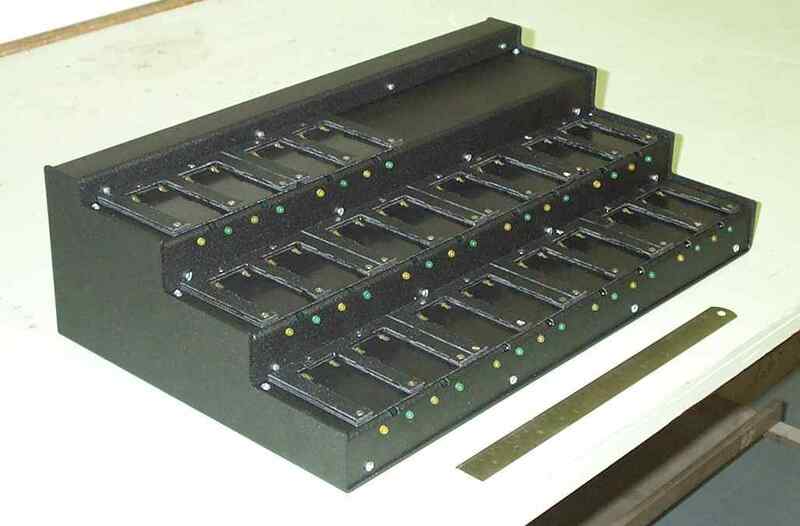 It can also be rack mounted, or repackaged for indoor use. The system monitors battery temperature to keep the charging temperature within the limits specified by Moly Energy for their MCR-1821C battery pack. The microprocessor controlled charge algorithm includes a soft start for cells that have been over-discharged in order to preserve battery life. Moli Energy's preferred charging method for LiIon batteries constant current / constant voltage ( CC/CV ), with the top-off voltage accurately regulated to ensure a full charge without an overcharge. A timer circuit is also included for safety, which cuts off the charge after a certain time even if the termination current has not been reached. This battery is used for a number of types of equipment, including the Trimble 29518, Trimble 46607, Trimble 5700 GPS Receiver, Tsc1 data collector, barcode scanners, and the HP Photosmart C912.